LOVE that rainbow card! May have to CASE you CASE-ing Dawn! Awesome! Oh my, these are both so gorgeous! But between you and me, I'm going to be CASEing your rainbow card- it's to die for! *gasp* Both cards are yummy, but the second one is amazing! I can't stop looking at it. Just lovely. OH MY GOODNESS, I am utterly in love with that rainbow card! I think I need to get me some pretty colored jewels! Crazy cuteness on that second card and the first is just simply divine! wow. these are simply amazing. LOVE your cards!!!! Love both of your cards, especially the baby card. It is amazing! OMG these are great! That rainbow heart card reminds me of growing up in the 80's and Punky Brewster, hee! It's so adorable! Your baby card is super sweet, too. Can I just say WOW! I LOVE your take on the baby card!! These are both so amazing. I love love love the rainbow colours on the first card. And your attention to detail on the second is inspirational! Thanks for stopping by my blog! You did a wonderful job CASEing both of those cards! Thanks for sharing! Oh my word.......both cards are delicious!!! The baby one is the best. Great job! Oh Wow both cards are just amazing. 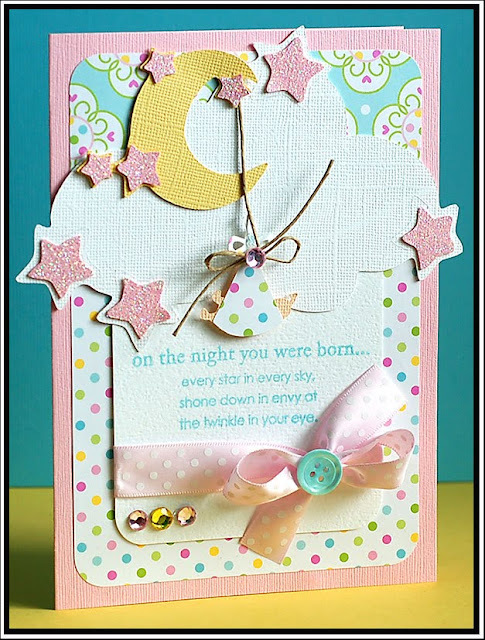 I love to create baby cards to I am drawn to that one. You did a wonderful job with this challenge!!! What great cards! They are both beautiful!!! I like them very much!!!! Nice job on both of them. I especially like the rainbow one though! I completely agree with you about Idol. I am not really impressed with anyone so far. Casey was pretty good. There are a few I liked in the beginning that I am hoping will get better though. Love all the details on your card. It's really gorgeous. Beautiful job on your card, I love them both! Absolutely gorgeous! I love your rainbows! Both of these cards are cute. I especially love the baby card. You are great at paper piecing! Outstanding job, Lea. I love them both. Both lovely, but that baby card is simply precious!!! You outdid yourself! Incredible cards and such different styles, but both done so well. I love your blog! Lea, Love the cards!! The baby card is fab! Great job on both the cards! Thank you for taking the time to post the instructions too! Beautiful work! I especially love the cheerful rainbow in the first card. What an awesome way to let someone know they are on your mind! Thanks so much for sharing! I don't "like" them.... I LOVE them!!!!! These are fabulous as usual, Lea! You just keep amazing me! I love the bright, cheerful colors on the first card and the soft pastels on the second one. Great job with the challenge! Swoon!!! You create magic with rainbow Lea! And I love that super sweet baby card! Your cards are so wonderful!!! Love them both!!! Both cards are gorgeous Lea! I love the rainbows too and the baby card is delicious! You have inspired me to check out Renaissance by Design, by the way. Ordered a few (yikes!) rolls of that luscious ribbon!! Both cards are great, but I just love the first one! Both cards are beyond words. The baby card is one that stops you in your tracks. Thanks for your cards. Both cards are sososooooo wow!! LOVE them!! Agreeing with you on idol. that rainbow card is fabulous! great job!! Love the gradient on your first card- so CAS but so striking !! These are both fabulous! What wonderful tributes to both designers! Both absolutely gorgeous Lea. So glad it's just not me thinking this, but most of this week's Idol has been bad. Casey and Crystal seemed to have the best performances & I think it was because they sang a fair bit of their songs without the band. Hopefully some of my favourites(Andy & Janell)make better song choices next week. Both cards are wonderful, Lea! Love 'em!! Great cards! Love the second. Way to make it your own!! Both are very cute! I love the cheerful rainbow card. Wow! Fabulous cards. I really love your first card. Great idea. Fabulous cards! I love your rainbow and the baby card is so sweet! You did a marvelous job! Yours cards are both so beautiful and eye catching!!!! Wow! I love how colorful both cards are! One card was simple and the other more complex, but they are both wonderful. Great job! Hmm, it says my comment published but I'm not sure, I don't see it, so once again, love that rainbow card! Great idea, so cute! The other is cute too. Both your cards are fabulous, but that rainbow card is divine! One of my favorites this hop. Both are great cards, but I especially like the first one! The rinestones set it off just perfectly! Looks like you've been faitful to leave lots of encouraging comments tonight! From a first time hopper and new blogger...Thanks!! It's nice to get NICE feedback! Enjoy the rest of your night! Both great cards! I especially like the rainbow one with the matching rhinestones. Girl... these are awesome! I LOVE rainbow cards... I said oooooohhhh in my head when I saw it... and that baby card is ADORABLE! Wow, Lea, the rainbow card is an amazing burst of color, so crisp and clear! The second one is just too cute, such soft and beautiful colors! Wow - your cards are both so different and both turned out wonderfully. The baby card has so much detail to take in! 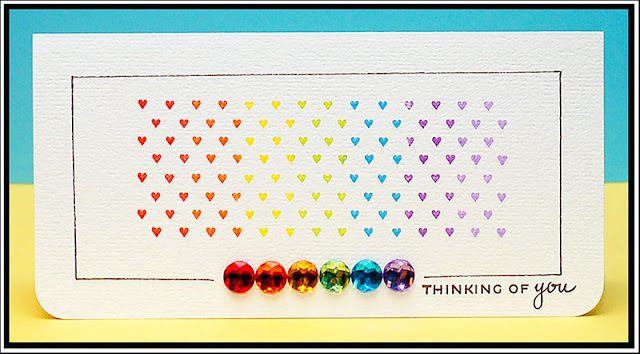 And I love the rainbow hearts card - so clean, crisp and fun! love your use of colours in the first one and the papers in the second...gorgeous!! Both cards are beautiful. The baby card is my favorite. Love that one! Over the top fab projets! I love the heart card. So very cute, and such a unique way to use that background stamp. Wow! The first is so cute with the rainbow heart and the second is gorgeous with the baby and the night scene--I love it! I really loved Betsy's card too! Both of these cards are so great, though I think the rainbow one is my favorite. Nice Job! Oh my, that is so cute!! Personally, I love yours and mine and Betsy's, too! These are great. I *love* the rainbow stamping card! This reminds me of a t-shirt I had when I was rollerskating to the BeeGee's! (did I just date myself?) Love the hearts with the matching rhinestones. A definate Gold!! both cards are gorgeous! congrats on your gold medal! Love both cards! CONGRATS on your Moxie Fab win, and such a FAB idea with those colors!